AJ is a graduate of Northern Kentucky University with a degree in Sociology with a minor in Business. AJ joined the Taylor Group of Companies in December of 2007 as a transportation broker. In just 5 short years AJ has completed the Sales and Marketing Classes that are both sponsored by the TIA, and is currently working on his CTB. Using the knowledge and experience gained while working at Taylor, he has moved into the position of Warehouse Coordinator. In his role, AJ works in all three divisions of the Taylor Group of Companies to assist customers in gaining total satisfaction. Overseeing Special projects, including devanning intermodal containers, freight customization, mode consolidation, and inventory control are just a small part of his daily operations. 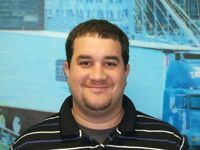 In addition AJ is our expert in LTL shipments and was the lead in implementing our new logistics module of our TMS. Working with LTL and truckload carriers to cover the US and Puerto Rico is something he has taken great pride in for Taylor Logistics. AJ is willing to make sure that the customers here are the first priority in every aspect. In his spare time, AJ enjoys spending time with his wife Catie, daughter Olivia, and two English Bulldogs, Jake and Maggie. He also is involved as a coach for the Highlands High School Varsity baseball team. AJ likes to root on the Cincinnati Reds, Cincinnati Bengals, and all Kentucky Wildcats athletics.